Have a smaller living room or secondary TV room? The Bose® Solo 5 TV sound system won't take up much space and offers a serious upgrade to the tiny speakers in your TV. 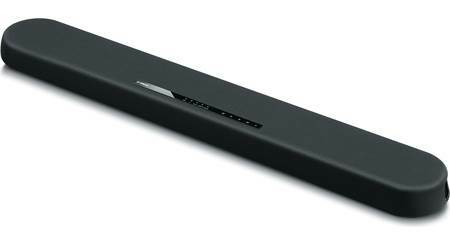 Measuring less than 3" tall, this sleek sound bar fits below most modern TV designs, flat or curved. And the system delivers the clarity and detail we expect when the name Bose® is on the box. 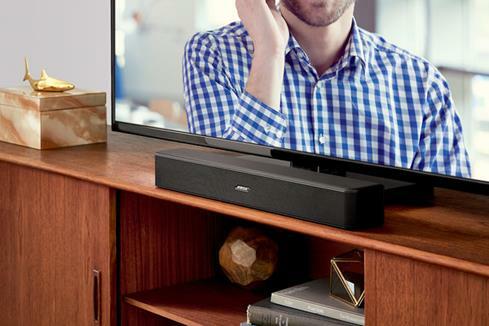 The Bose® Solo 5 TV sound system fits neatly in your setup and provides big Bose® sound. There's also built-in Bluetooth®, making the Bose® Solo 5 a space-saving solution for movies, shows, and music. Bose® specializes in making things easy to hook up and use right away. This system connects to your TV with a single cable. An optical digital cable is included. 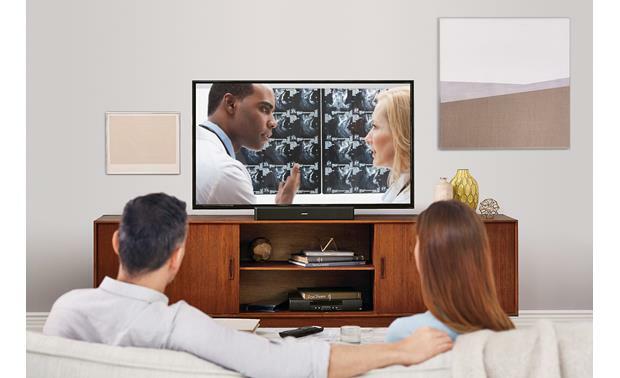 The Bose® Solo 5 system automatically recognizes when you've connected it your TV. And the programmable universal remote can operate your TV, Blu-ray player, cable box, and other components along with the sound bar. 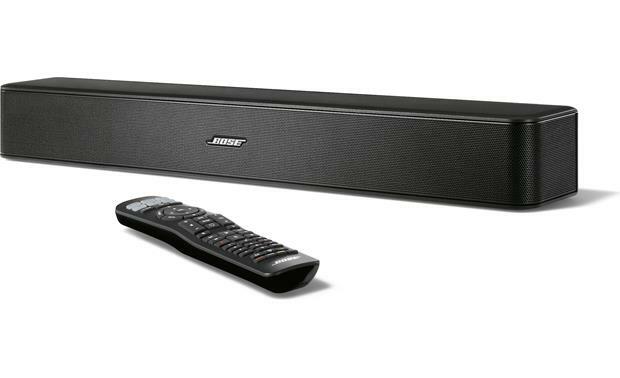 This sound bar can be wall mounted with the Bose® WB-120 wall mount kit (sold separately). Our customers often tell us they have to crank the TV volume up to hear speech, only to turn it down when music and effects get loud. With the Bose® Solo 5 system, you don't have to do all that. You can hear even whispered dialogue at reasonable volumes. A special "Dialogue mode" makes speech even more audible. And bass for sound effects? Dial in just the right amount of low-frequency impact with the remote's bass control button. More and more people use sound bars for music listening as well as TV. The Bose Solo 5 TV sound system makes that easy. It has Bluetooth on board, which lets you stream audio from your phone or tablet. Have a killer library of downloaded tunes? Stream playlists from music services like Spotify® or Pandora? Any song you can play on your device can be played wirelessly through this system. Can I use one input from the TV and the other from my DVD Player to get 5.1 sound from either one? This sound bar is only two channel stereo. It will not do 5.1 surround. I agree with William N T's answer. It would be the best way to connect devices with the Bose Solo 5. Active Soundbar Speaker: The Bose Solo 5 is a one-piece soundbar speaker system that brings noticeably better sound to your flat-panel television. It's engineered to help clearly reproduce everything from dialogue, music, to sound effects. 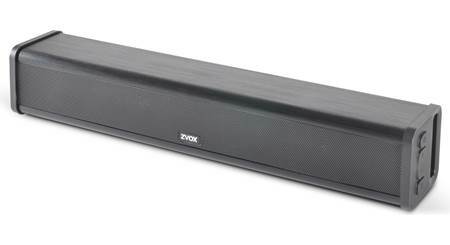 The Bose Solo 5 incorporates TrueSpace technology, Videostage circuitry and a Dialogue mode to get the most enjoyment from this one-piece soundbar speaker system. TrueSpace Technology: Bose TrueSpace technology creates a simulated surround-sound experience from the soundbar speaker's two drivers. Videostage Circuitry: TrueSpace technology works in unison with Bose Videostage decoding circuitry to deliver a lifelike, spacious multi-channel sound experience from almost any source. Dialogue Mode: Dialogue mode makes every word even easier to understand without having to adjust the volume from scene-to-scene. Dialogue mode is also great for news programs and talk shows. 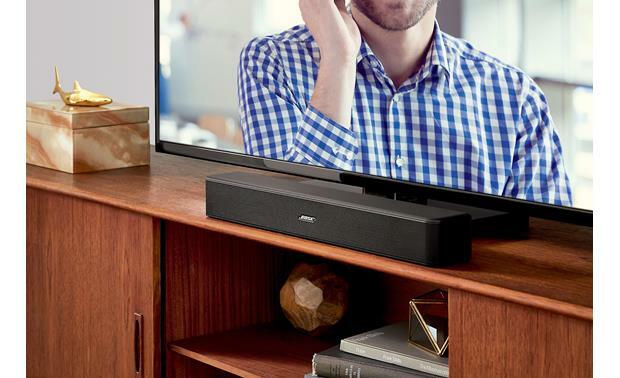 Digital & Analog Inputs: The Bose Solo 5 soundbar speaker is fitted with two digital inputs (optical/coaxial) and one stereo minijack input (3.5mm), so you can connect virtually any TV. 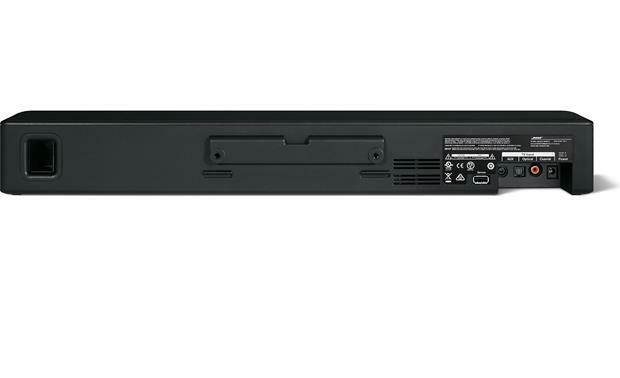 The optical and coaxial digital inputs support 2ch PCM and Dolby Digital (up to 5.1ch). To enjoy the full benefit of hearing audio through the Bose Solo 5, the internal speakers in your TV should be turned off. Note: The digital optical output terminals of most newer flat-panel TVs only send an audio signal in 5.1ch when receiving Dolby Digital surround sound from the TV's built-in tuner, network connection, or connected USB device; and will output only 2ch stereo from sources connected to the TV via HDMI, or RCA (like your Blue-ray/DVD player or satellite/cable box). Bluetooth Music Streaming: With built-in Bluetooth, the Solo 5 can wirelessly play back stored music and music apps from your Bluetooth-enabled Apple iOS iPod/iPhone/iPad, Android smartphone/tablet, Windows Phone/PC, Mac computer/laptop, or other Bluetooth compatible devices. You can control basic music playback functions (like Play/Pause & Previous/Next Track) from the included remote control. Song/artist information will still be viewed on your Bluetooth device. You can pair up to 8 devices and keep 2 devices connected for easy switching between devices. Note: Due to the differences in Bluetooth technology, some Bluetooth enabled devices may be incompatible, function improperly, or may not support all features when used with the Bose Solo 5. Bass Level: You can adjust the Bose Solo 5's bass performance to your liking from the included remote control. Universal Remote Control: The Bose Solo 5 includes an IR universal remote control for wireless operation of the soundbar speaker. You can also program the universal remote to control your TV, DVD, Blu-ray Disc player, cable/satellite box, game system, or DVR. You can also program most other manufacturer universal remote controllers to operate the Bose Solo 5 soundbar. Mounting Options: The Solo 5 soundbar speaker can simply be placed on flat tabletop surface in front of your flat-panel TV. 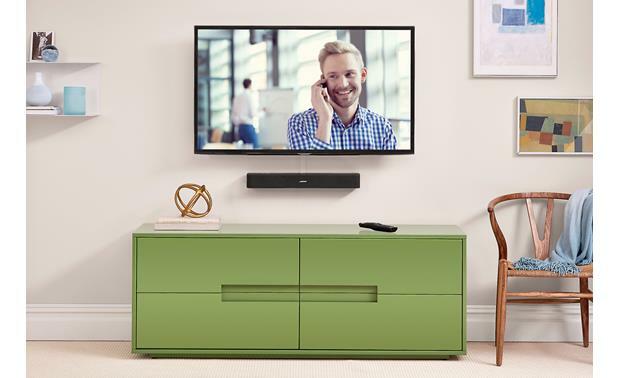 The Bose WB-120 Wall-Mount Kit (018WB120, sold separately) lets you wall mount the Solo 5 soundbar speaker under or above your flat-panel TV. Auto On/Off: You can set the soundbar to power on whenever a sound signal is received. 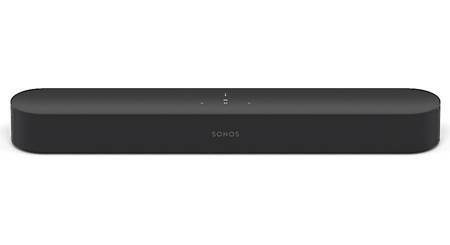 The Solo 5 soundbar speaker will also automatically power off after one hour if no audio signal is present. Does Bose offer a simpler remote for this? I just need volume and channel change control? Yes it does. The package I purchased has a small remote that just controls the sound bar(volume, bass control, switching between tv or Bluetooth, etc.) so I have to use two remotes one to control tv, then the Bose for the sound bar, but it's no big deal. Check if available from Bose? Not that I am aware of. But the remote is easy to set up and use, even if you are just using it to change channels and volume. For the price how does this compare to the solo 15 as far as sound? Is there a subwoofer out or wireless subwoofer option? There are no sub outs. What you see is what you get. The only wireless feature is the Bluetooth input. The Solo 5 works very well on its own in small to medium size rooms. Does it come ready to mount? Will it mount on a 4" upright? It has threaded holes that mate to a wall mount, sold separately by Bose. Not sure if a standing mount is available - it is larger than most Center/dialogue speakers. I just bought a element 4k smart TV 50" with Amazon fire already installed. Would this work ok with it? Yes, it will work great with that TV. Enjoy!! How long is the Dc power cord that runs from the power pack? It about a 6 inch cord it's not extremely long but it's not to short . It will fit where you need it. Is it compatible with a 65" Sony Bravia ? Do I need to use the Bose remote exclusively to raise volume? That is the only way I have ever done it for what it is worth. does this work with bluetooth from amazon echo ? I am sorry but I do not know the answer to this question. Is this magnetically shielded for tv? I have it directly touching my tv and it doesn't affect the image at all. Hope this helps. I am not sure if it is magnetically shielded but it works beautifully with my 42" Sony flat screen TV that I purchased from Crutchfield. I could not get it to work like that. I had to turn it off to get sound from the DVD player. I am afraid I cannot answer this question, since I do not have this setup. I would suggest you go to the Bose Homepage and either look at the Instruction Manual for this product, or you can send Bose a question directly. I have always found the Company to be extremely helpful and responsive. I like my Unit very much. Hi Tom. I bought the Bose Solo 5 for our bedroom a few months ago, and we like it a lot. I have one Digital Optical audio cable running from the Bose Speaker to my Samsung TV (the cable connects the 'TV Input' port on the Bose speaker, to the Digital Audio Output port on the TV). I then have 2 HDMI cables running into the TV, one from my cable box and one from the blue ray player. The Bose speaker then works just fine for both inputs. It doesn't really sound like 'surround sound', but its MUCH clearer and louder than just the TV speaker. Hope this helps. Good luck! Can the Solo 5 be used as a center channel speaker? I have a set of 301's that I would like to use with a powered sub in a 3.1 system? I use apple tv and iTunes to play my music library through my tv. How does music sound coming through this speaker? I have Apple TV hooked up to our 40 inch TV in the bedroom. I occasionally play music on it from iTunes via the home sharing feature. I think the music sounds ok, but it certainly doesn't feel like a selling feature in my opinion. The music plays, and its clear, but it doesn't really pop. Really no bass to speak off. I think the Bose 5 does awesome serving as my TV speaker, but if I listened to music regularly up there I'd personally just get a cheap portable speaker, or just listen to music directly from my phone speaker. Music from the Bose sounded nothing like music from my authentic 5.1 / 7.1 setups in other rooms. Not even close. Hope this helps! I have the Bose Solo 5 in our bedroom, and full 5.1 & 7.1 surround setups in other rooms of the house. I personally don't think that using the Bose Solo 5 as a center channel is a great choice. Sure, it looks like it should work, but the fact that the Bose doesn't receive traditional speaker wire inputs feels like a potential deal breaker. Hi Jerry, from a look, feel and performance perspective I do think this could serve as a center channel speaker. HOWEVER, this speaker is NOT connected by traditional speaker wire. Instead it gets input from an audio jack that I have running from the bedroom TV (I do not have a home theater receiver hooked up in that room, which is one of the reasons I personally bought the Bose Solo 5). Therefore, you may not be able to hook it up as a center channel speaker from a traditional receiver (but you can always ask Crutchfield, who obviously knows more than I do :). Good luck! Just setting up my Bose Solo 5 and realized there's no audio out for a headphone. Is there any way around that? With your purchase from Crutchfield, feel free to contact our Tech Support team. They can walk you through the settings/connections on the product and see if there may be a fix. Our toll-free Tech Support number is printed on your invoice, and is also available under the "My Orders" tab in the "My Account" section of our website. If you did not purchase the unit from Crutchfield, then you may want to contact the manufacturer. You can also post your question in our forums: http://community.crutchfield.com. Or try our online support center: http://crutchfield.custhelp.com/app/answers/list/kw/. Can this unit be hung above or VERTICALLY to left or right of the TV? Thanks. The Solo 5 can be wall mounted above or below the TV. This requires an optional wall mounting kit (Bose WB-120). I wouldn't recommend mounting it vertically due to the Left-Right channel separation (things just wouldn't sound right). Our unit sets on top of the furniture cabinet that the TV stands on. The Solo 5 works very well for our den that is about 10-ft by 12-ft.
Will a directv remote work on this Bose system? Call the bose number to find out I use only the bose remote for my. Don't know but Bose remote will work direct tv. hi - just wondering if you can use an audio out for headphones - thanks? Searches related to the Bose® Solo 5 TV sound system .